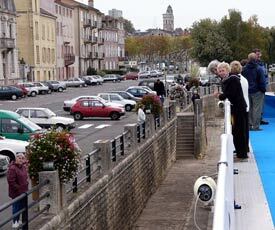 ABOVE: The MS Maribelle arrives in Macon, France, within walking distance of sights and shopping. Viking's cruises on the Rhine, Danube, and other European rivers offer similar fares and air/transfer packages. Add-on land extensions are available, or you can combine a river cruise with a do-it-yourself land vacation. Doing the math: Crunch the numbers, and you'll see that the "per diem" or daily cost starts around at around $265. The fare include everything except airfare, tips, and bar drinks. For your money, you're getting the equivalent of a deluxe group tour with meals in fine restaurants--plus time spent cruising along some of Europe's most beautiful waterways. Is the expense worth it? Most of the passengers on our MS Maribelle cruise seemed to think so. Also, river cruising attracts repeat customers, particularly among older voyagers who enjoy the "unpack once" convenience of river travel. Bottom line: If you can afford it, if you aren't a loner, and if you prefer sightseeing to sea days, a river cruise can be a delightful way to tour the inland regions of Europe--especially if you travel outside the hot, crowded summer months of July and August.